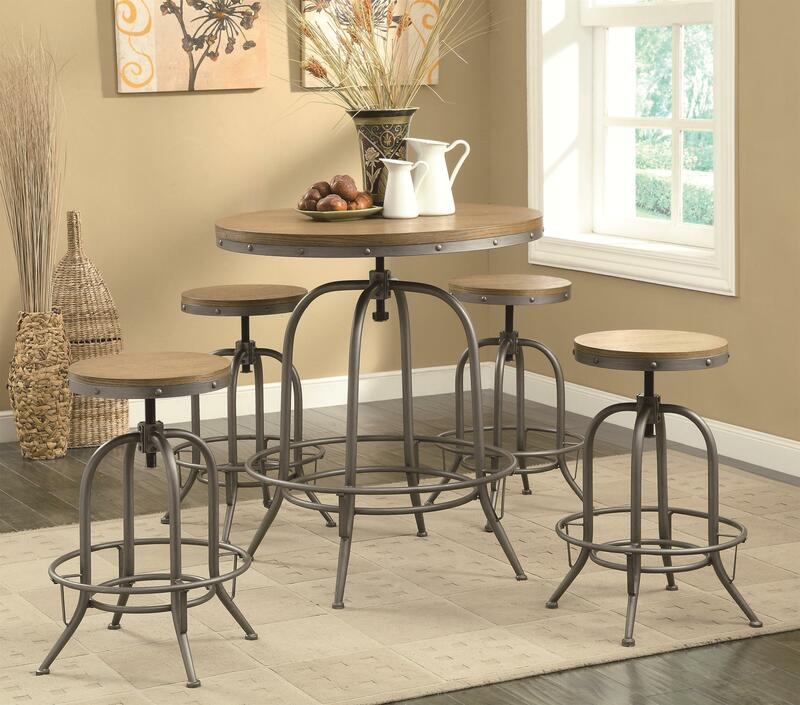 Offering the perfect blend of elegant simplicity and transitional functionality, this round bar table and stool set will be the perfect addition to any dining or entertaining space. Featuring a distressed wood table top and a contrasting metal base in an industrial black finish with decorative bolt accents, this table will add an industrial-style flair to any room. Round footrests offer support while the adjustable height capability helps the table and stools cater to your every comfort need. Each piece has a turn lock to ensure a secure and stable position. The Bar Units and Bar Tables Transitional Adjustable Bar table and Stool Set by Rooms Collection Two at Rooms Furniture in the Houston, Sugar Land, Katy, Missouri City, Texas area. Product availability may vary. Contact us for the most current availability on this product.